We would like to invite all musicians, bloggers, song writers, fashion designers, painters, sculptors, crafters, video makers, cooks/chiefs, decorators, designers, photographers, theatre actors, makeup artists, digital artists, poets, and others who want to awaken their artistic side. 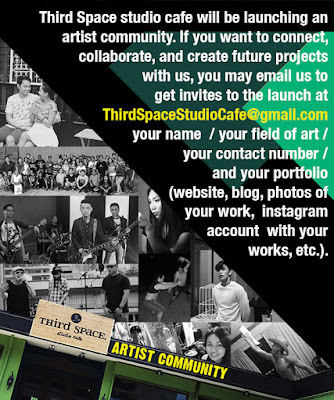 We are creating an artist community at Third Space studio cafe. I'm not comfortable back then when others would use the word "artist" or "artistic" to describe me based on what I do. Don't get me wrong; I feel flattered, just not that convinced that I can label myself as anything specific. When people ask me what it is I really I do, it always makes me sigh, like it's a dreaded question dahil sa totoo lang, sa dami ng ginagawa ko hindi ko alam kung ano talaga ako. I write songs but I'm not comfortable calling myself a composer. I paint but I don't consider myself a painter. We own a restaurant, and yet hindi ako kumportable tawaging restaurateur, and the list goes on. I have much respect for those who are really deep into those fields, and I can't put myself on the same category as they are. I don't consider anything I do as a career. I just do what I do because it's fun for me. I am not properly trained in any form of art. I didn't study any style, or proper technique in anything I do, but it's a personal choice, because I like producing original creations based on what I can do, and what I imagine. What others think of my technique is not my concern. Making people think or relate to my concepts is what I enjoy. Getting involved with producing random things for fun, and collaborating with others helped me feel comfortable being addressed as an artist. Music is an art. Sculpting is an art. 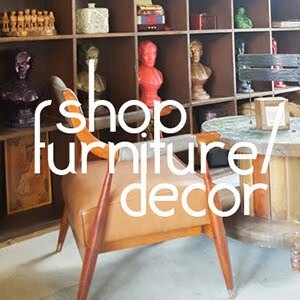 Furniture making is an art. Writing is an art. Painting, video making, crafting, decorating, acting, directing, cooking, all involves artistry. Digital artists, bloggers, poets, makeup artists, dancers, singers, photographers, fashion designers need to use their imagination and creativity for their art as well. It made me realize that everyone has an artistic side, therefor everyone can be an artist. Creativity being one of the things I try to advocate, made me want to bring together others who want to indulge their artistic side. 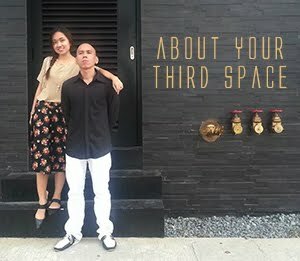 Elle and I talked about this and here are our reasons why we want to have a creative community at Third Space studio cafe. -Help others launch their creativity. -Help promote other peoples talents, crafts, and skills. -Gather and connect like-minded individuals to make it easier to collaborate with each other. -Help them profit from their art. -Have more people advocate creativity to less fortunate kids, through charity projects. -Provide a place for different kinds of artists, where they can hold exhibits and shows, for their creations and talents. -Have an artist community where concept is placed above skill. Sometimes the simplest reason is the best one. Represent your art.